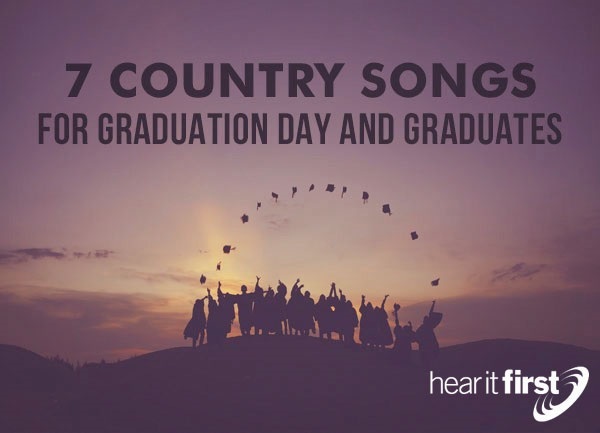 Here are seven great country songs for a graduate on graduation day. The song, Laughed Until we Cried, by Jason Aldean, is like someone who’s arrived at a destination (adulthood) and is reminiscing about all the stops along the journey. In looking back, they remember, “We talked, and drank, and danced, and said goodbye. We laughed until we cried,” saying “Oh man, we were livin'. Sittin' there reminiscin’. We sang, and talked, and traveled back in time. We laughed until we cried.” What friend can’t identify with the former days as being, “Every emotion rolled into one. A little of this, a little of that. Kinda happy, kinda sad.” Life sounds a lot like a roller coaster because there’s a lot of “Kinda happy, kinda sad,” sort of up and sort of down. My Wish, sang by Rascal Flatts, is a powerful song about the future, because that’s what graduation day is all about. They sing, “I hope the days come easy and the moments pass slow, And each road leads you where you wanna go,” and as if a parent is giving a graduate advice, sings “And if you're faced with a choice, and you have to choose, I hope you choose the one that means the most to you, And if one door opens to another door closed, I hope you keep on walkin' till you find the window.” This may be the wish for every parent, that their child’s “dreams stay big,” but “your worries stay small.” What more could you desire for a graduate than this? The song, Wide Open Spaces, by the Dixie Checks, is about someone who’s about to leave the nest and spreading their wings to take flight. Thus, it makes it a very suitable country song for graduation day for the graduate. This song asks, “Who's never left home, who's never struck out. To find a dream and a life of their own. A place in the clouds, a foundation of stone.” The young woman who graduates “needs wide open spaces. Room to make her big mistakes. She needs new faces. She knows the high stakes,” but the graduate can say, “She traveled this road as a child. Wide eyed and grinning, she never tired. But now she won't be coming back with the rest. If these are life's lessons, she'll take this test.” The wisdom in these lyrics, like leaving room for “big mistakes” and knowing the stakes are high, she finally realizes “she won’t be coming back with the rest,” but facing “life’s lessons, she’ll take this test,” and hopefully pass with flying colors. If you have a graduate who loves country music, I believe these seven songs would be suitable for them. Perhaps you can think of another country song that would be appropriate for the graduate on graduation day. If so, please feel free to suggest it and we can see if we haven’t missed a song we should have included. Graduation day is one of the most exciting days in a person’s life, but it can also be one of the most worrisome. Let these songs encourage you, if you’re a graduate, because life is like a vapor. Don’t blink or you might miss it.